We are a health and wellness website, offering recipes, workouts and lifestyle tips. 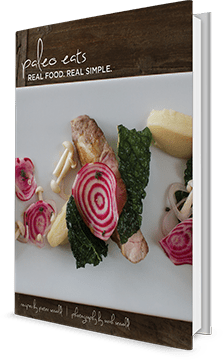 Our recipes focus on a primal, paleo and "real foods" perspective. Put all of the shredded coconut and coconut oil in the Thermomix and set temperature to 37C and blitz for 3 minutes on speed 8. You will need to stop from time to time to scrape down the sides and ensure that all of the coconut is being blended. The heat will help to release the oil in the shredded coconut and bring it all together in a butter consistency. This is also very to make in a food processor. You need the same ingredients in the food processor, but the blending time may take 8-10 minutes, or more depending on how often you need to scrape down the sides. Once you are happy with the consistency add the strawberries, vanilla and maple syrup and blend until smooth and creamy. Pour the mixture into a lined baking tray and place in the freezer to set. Once set melt the chocolate and pour over the slice and put back in the freezer to set. Once the slice is set, remove from the tray and slice into pieces. Store in an airtight container in the freezer. Remove from the freezer 20 minutes and allow it to thaw before eating. It’s still good eating when it’s frozen – just a bit hard on the chompers!! 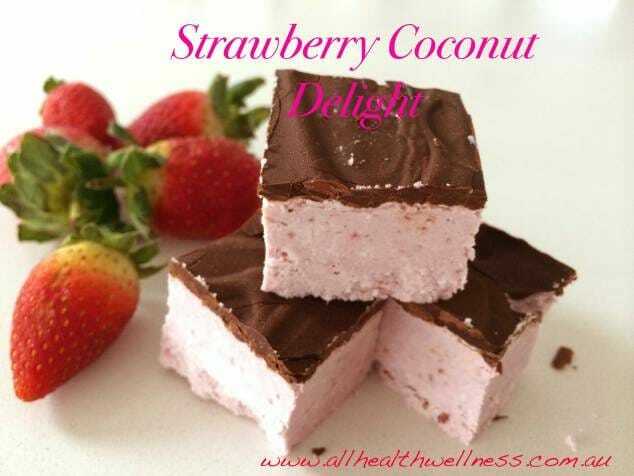 Amy\’s \”Ohh happy Sun-day\” Strawberry Coconut Yoghurt Cake Delight!